In the second message, Ivanoff emphasized that reconciliation is a journey that requires tears. Restored relationships require deep pain. And true neighbors (Luke 10) are those who are willing to enter into stories of brokenness – marriages on the rocks, racial tensions, uncomfortable places – and be fully present. True neighbors offer their lives and don’t hide behind band-aid solutions. There are many social ills that plague native peoples in the U.S., and most can be traced to social injustices (one of the most tragic being the Trail of Tears). To continue making progress, moreover, people must also move from being a neighbor to lamenting. To be gripped by the high cost of reconciliation is to embrace lamentation in prayer. For “reconciliation without lament cheapens hope.” By entering into people’s stories and lamenting with them, we together place our ultimate hope in the reconciling power of the cross. 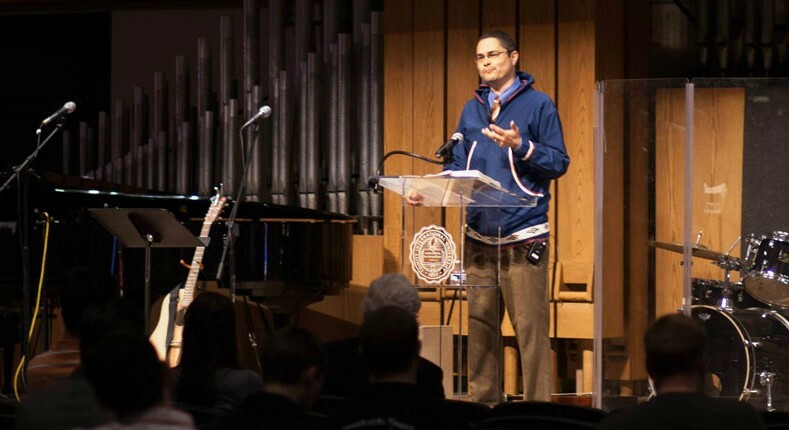 Curtis serves as the Field Director for the Evangelical Covenant Churches of Alaska. He was raised in Alaska and has a deep desire to see people from this state come to know Jesus, for more laborers to be raised up to be sent out into the world to share God’s good news. Curtis is married to Kristi and they have three children. He enjoys fishing, photography, Oklahoma Sooner football and re-creating food dishes he sees on Diners, Drive-Ins and Dives.